For larger projects, I’ll tackle the “next important task” first. If sequentiality is ambiguous, I’ll tackle any easy task. Moving everything out of a hoarding abode is tricky because things will accumulate randomly without curation. Rather than just moving clutter from one area to the next, I’m focusing on critiquing each object and collection, starting with the easiest stuff: recycle the near garbage once collected for potential art/troubleshooting projects and sell or store videogame collections. Objects have always seduced me. In childhood, I would compulsively pick up interesting objects that I would walk by off to the side of the road, perhaps thinking about whether or not I could create anything from it. I have sometimes. However, it’s not so much that I’ve given up on building art installations as much as this isn’t a priority for me right now, and when it does, I will have more money to actually buy tools to either turn junk into art or turn raw media into art. No need to hold onto some random plastic because it looked cool ten years ago. I had collected many project computers before and during my small business, as explained in “Letting Things Go.” Each represented an ideal situation where I could either revive some fallen hardware, accomplish some task, or help someone in some technological regard. Unfortunately, I was still knee-deep in the idea of being seduced by fanciful ideas rather than working projects until they were complete. Recycling these old printers and computer parts to companies that can use them might be a better way. Now, onto exciting videogame collections! Since videogames are effective babysitters, I amassed a number of videogames for various consoles, and with the hoarder’s mentality, I was able to keep everything. After joining the workforce and affording myself an irresponsible disposable income, I bought as many of the cheap videogames that were hitting the market as I could. This was before videogames were seen as cool. The last of the freaks were selling or donating their collections, maybe due to family or peer pressure, or maybe because their interest had waned? Where are these videogames now? Stored in random locations, most having not been played for over 10 years, just sitting and collecting dust as my interests moved on. Part of the moving process includes deciding: how many times do I want to move this object? Once more, to be sold or donated, or several more because it holds value to me? Some videogame collections, like my NES collection, can be reduced by 20% without any remorse, whereas other collections are nearly completely childhood affairs with nothing that could be sold off guilt-free. I’m knee-deep in playing, cleaning, and sorting my NES collection. If I collect, catalog, compress, and… put away those collections that are more easy to consider overall, it will give me more shelf room to work with the stuff that might require more curation time. I started with my Dreamcast, Playstation 1, and Jaguar videogame collections. Inspirations: I want to summarize every major milestone as I progress from hoarder to well-adjusted collector of curated items. 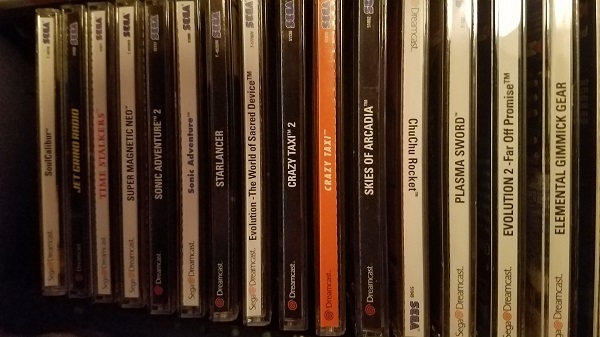 Above: My dusty, unorganized Dreamcast collection. 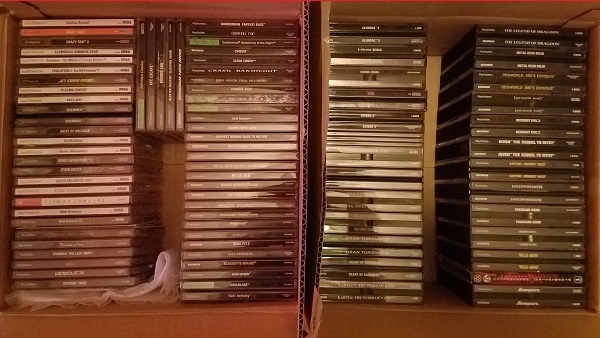 Below: Two of three videogame collections boxed up and ready to move. [Sammohini Arc] More Passive-Aggressive Punkery!